So what do oil wrestling and ballet have in common? Well, maybe not so much, however Turkey has a festival dedicated to both of these pursuits. In Turkey we love a good festival, so here’s a quick look at 5 of our favourite festivals in Turkey. 1. Kirkpinar Oil Wrestling Festival – held in Edirne in July every y ear, the Kirkpinar Oil Wrestling Festival draws crowds of thousands. The wrestlers are known as “pehlivan”, and wear traditional trousers made from cowhide as they wrestle, covered in olive oil. This event has been listed by UNESCO as an Intangible Heritage event, and is believed to be the longest standing annual sporting event in history. Dating back to the 14th century, the festival continues today, and is a serious sport with the young wrestlers completing an apprenticeship under a master. The competition is accompanied by drumming and bands that play traditional music that has been played at the event ever since its inception, providing a great atmosphere during the event. 2. Bursa International Folklore Festival has been held in Bursa since 1962 and showcases lots of different types of folk music and includes a folk dancing competition attracting dancers from all over the world. It is held every year between 7-12 July, and if you attend you’ll also be able to see symphony orchestra performances, theatre performances and art exhibitions. 3. Mevlana Festival, Konya – This festival honours the life and death of the famous Sufi mystic Rumi and is held in Konya from 10-17 December every year. Rumi was the inspiration for the establishment of the Mevlana order of Sufism, commonly referred to as “whirling dervishes”. 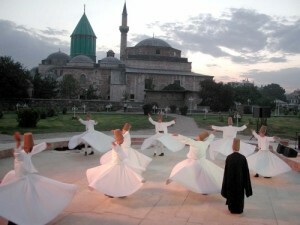 The whirling dance performed by the dervishes is known as the “Sema” ceremony. It is performed with one hand up to signify accepting the love of God, and the other hand down to connect with God’s creation. The Sema ceremony is considered to be so special that it has been placed on UNESCO’s Masterpieces of the Oral and Intangible Heritage of Humanity list. The festival is held at Konya’s Mevlana Cultural Centre, and the sight of the dervishes performing is an amazing experience for those who attend. A tradition in Turkey’s Aegean Region, the Selcuk Camel Wrestling Festival is held on the 3rd Sunday of January each year in an ancient stadium in Selcuk. There is much debate about its origin, however it is believed that camel wrestling began in Aydin, a large city just under an hour from Selcuk. It is believed the tradition was started by nomads who made their camels wrestle against the camels of other nomads as part of the general competitiveness between. Camels will often naturally wrestle in the wild and so an organised competition was a natural extension of this. These days the events are held as a fund-raiser for charity and carefully supervised and regulated by the local municipality. The camels are especially breed for the competitions, and wrestle in a weight class. They wear highly decorative cloths behind their saddle and before the competition they will be paraded through town by their owners, who also often dress in traditional costumes. A highlight of the competition is the music and also the commentator who is usually very colourful in his commentary and will often read out poems as a tribute to the camels. So, an opera and ballet festival is possibly not the first thing you think of when you think of Turkey, but the International Aspendos Opera and Ballet Festival has been running since 1994 and draws big crowds in September every year. Nominated as one of the top 5 opera festivals in the world, performances are held in the beautiful ancient theatre of the ancient city of Aspendos which dates back to 166A.D, and provides a truly unique experience for everyone who attends. Posted in Culture and TraditionsTagged aspendos ballet, aspendos festival, aspendos opera, camel wrestling, festivals, mevlana festival, oil wrestling, turkeyBookmark the permalink.